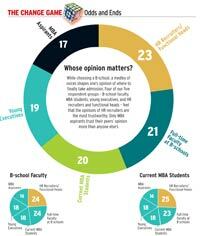 While choosing a B-school, a medley of voices shapes one's opinion of where to fi nally take admission. Four of our fi ve respondent groups - B-school faculty, MBA students, young executives, and HR recruiters and functional heads - feel that the opinions of HR recruiters are the most trustworthy. Only MBA aspirants trust their peers' opinion more than anyone else's. Take a wild guess. Well, you don't have to, really. 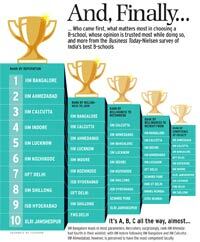 Placement success is valued the most by almost every group while evaluating a B-school. Only one stakeholder, the HR recruiters & functional heads group, trusts its peers' views as much as placement success.